Recently, I was contacted by Tiffany from Udemy.com (a platform for online learning) about their course on React and Flux. “Hmm, another course on React, yeah, all right” I said to myself. Then, she sent me a coupon for this course (making it free), so I gave it a try (“what’s to lose, right?”). It turned out to be a pretty good one, actually! It begins by introducing React, explaining its fundamental concepts, and then moving to more advanced topics such as view composition, Flux and React Router. Stephen Grider, the course instructor, also shows us how to use Firebase together with React to build dynamic web apps. If I was starting all over again, I would definitely go through the Udemy’s React lecture instead of trying to learn it haphazardly — I would save so much time. Anyways, so I got this coupon — actually, I got another 49 of them! — waiting to be redeemed. Let’s do a little competition: the first 49 of you who retweet, mention or favorite this article on Twitter are going to be awarded one. If some of them remain, I’ll simply place the coupon’s code next week. Sounds good? So here’s the code: WordPressExplained. It should be still working, but you should hurry and redeem it now! One thing is to study React from the comfort of your home and another, completely different one, is to experience it live. That’s what Reactive2015.com is all about. It’s a three-day conference dedicated to React and reactive programming that will take place in Bratislava, Slovakia (my hometown, yay) between 2nd and 4th November this year. Whether you are a React novice or a veteran, it’s absolutely worth coming. For me, it’s the speakers — creators of many popular JS libraries (e.g. Cycle.js, DataScript, Socket.io) — but for others it might be the famous Bratislava’s night life (lots of relatively cheap bars; note: I don’t drink much). All in all, Reactive2015 one of the first events of its kind in the world so don’t miss the opportunity to be a part of it. Now, the discount. As the organizers of the event (vacuumlabs.com) are my friends (and my previous employer), I managed to get a promo code with a discount of 25 Euros (~28 dollars) for you. 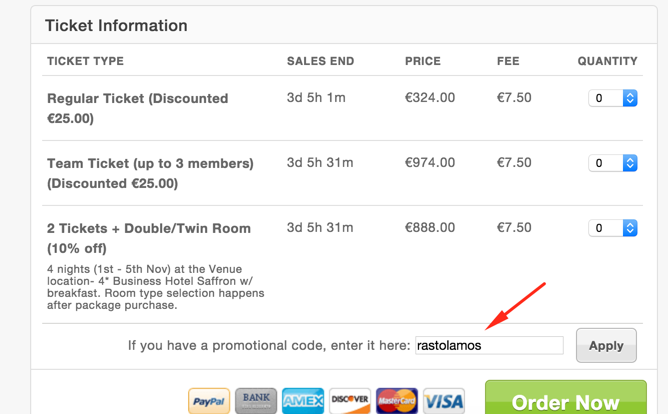 Just enter rastolamos when buying a ticket on the event’s Eventbrite site and you have it. Figure 1: Promo code for Reactive2015. Beware, the discounted price for a regular ticket will end in ca. three days (as you can see from the screenshot above). Then it will be 50 Euros more. By the way, I’ll be there too so we can meet in person and have a nice chat! I hope my special offers will help you in your journey to learn and understand React better. First you study it at Udemy for free and then you see it live on Reactive2015. Isn’t life great?